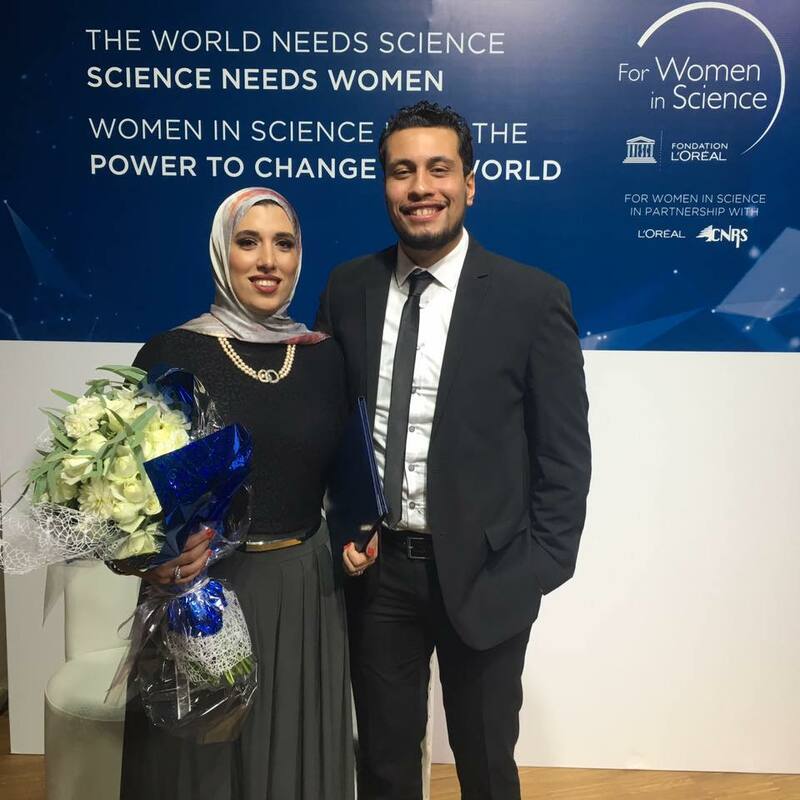 #LINO18 young scientist Menattallah Elserafy, 28, from Egypt, is a postdoctoral researcher at the Center for Genomics at the Zewail City of Science and Technology in Giza, Egypt. In her research work, she uses budding yeast as a model organism to discover new DNA repair players. This is mainly done through performing yeast genetic screens. The function of the identified genes is then studied in mammalian cells. Finally, they screen patients’ samples of relevant diseases to check for suspected gene mutations. Enjoy the interview with Menattallah and get inspired. My mum is the one who encouraged me to study Biotechnology during my undergraduate studies. She convinced me that this field is unique and that the world of diagnostics and therapeutics will be greatly transformed in the future by medical biotechnology. During my bachelor studies, I developed a passion for molecular biology. I found understanding the tight regulation of all processes inside the cells impressive. That’s why I decided to pursue my Master’s studies at Heidelberg University in Germany to study molecular biology in depth. During my PhD at Heidelberg University and my postdoctoral time in Egypt, my motivation for science grew. The more I tasted the satisfaction of obtaining new findings, the more I got intrigued to dig deeper and understand better. Science does not only satisfy my curiosity, but also represents a hope for change in my developing country. You can be inspired to start a career journey, but you definitely need the support to grow and excel. My main source of support now is my husband. He is always proud of me and just wants to see me develop more in my career. We promised each other that we would always push ourselves to excel on the professional level. I was influenced by several people who shaped my personality. My role model in science is the Egyptian late Nobel Laureate Prof. Ahmed Zewail. He was a source of inspiration for me as a kid, as he was unique in the sense that he made the best out of all chances given to him to add something and leave an impact. I always admired his passion and dedication to improve scientific research in Egypt. He fought hard to establish the scientific research hub ‘Zewail City of Science of Technology’, which I am currently working at. I will always be grateful to him, as without his persistence to make the ‘Zewail City’ dream come true, I would not have been able to return to my country after my PhD to pursue research that satisfies my ambition. My parents have also always been a source of inspiration because of their endless support in my career journey. This made me realise the tremendous impact parents have when they respect their children’s goals and pave roads for achieving them. Finally, my grandparents taught me two main key lessons that I always try to follow. My grandfather, who was an ambitious, successful medical doctor, always reminded us that one should always transfer the knowledge he/she has to others. Keeping what you know from others makes your knowledge of no benefit. My grandmother taught me that offering help to others and making people’s life easier is something a person should always try to do. As I grew up, I realised that the more you help people in need, the more you will find people standing next to you when you need them. I obtained a Bachelor of Biotechnology from the German University in Cairo in 2010. Then, I pursued a Master’s in Molecular Biosciences (Major Molecular Cellular Biology) and a PhD in Molecular Biology at Heidelberg University in Germany. The biggest challenge I faced was moving abroad in 2010 at the age of 20 to start my master’s studies. I was quite young at that time and my research experience was very minimal. I had to fit into the German system of education and learn how research is performed at top institutes. It took me almost a year to adjust to the system and to be able to perform well. However, after this phase ended, my performance greatly improved. Therefore, I think every student/scientist who would like to excel in his/her career will definitely face troubles and disappointments, but the ones who will manage to excel are those who did not give up at the hardest times. The main challenge other researchers and myself face while pursuing a career in science is overcoming the frustration resulting from unsuccessful experimentations. A scientist should always find alternative ways to achieve results and be pushed to think outside of the box to innovate new tools to test his/her hypotheses. Every now and then, I also face the same problem and I always push myself and try to look for alternatives. Three main mentors taught me a lot about science, Prof. Elmar Schiebel, who supervised my master’s and PhD thesis. He taught me a lot about yeast, and I developed a great passion for yeast research in his lab. I am also grateful to him for teaching me a lot about science and the importance of documentation and being very organised while performing experiments. 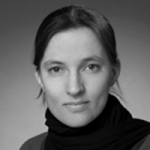 I also learned a lot from Dr. Mirela Šarić, my postdoctoral supervisor during the master’s thesis. She taught me a lot about academic life. My current mentor is Prof. Sherif El-Khamisy. I am currently working under his supervision at the Center for Genomics in Egypt. I learned a lot from him about the importance of translating basic research we execute in the lab to outcomes that satisfy the needs of society. I also learned from him the importance of keeping research standards high to push scientific research in Egypt forward – not only to meet the international standards but also to compete with world-class institutes. I am also grateful to him for teaching me the importance of thinking out of the box, valuing time and aiming very high. The coolest project I have worked on was a side observation that we could not explain and involved a lot of frustration at the beginning. During my PhD, I have been working with the S288C budding yeast background strain. After I moved to Egypt, I started using W303, as this strain is more common among yeast DNA repair labs. I obtained findings that did not match published data. So, I started checking the literature to find a way to explain the results. I realised that a specific mutation in a gene called RAD5 in the W303 background strain could impact the results we get significantly. Moreover, I got to know that many yeast labs have corrected the W303 mutation and started using the modified one. This issue was hinted to in some papers but in a very indirect manner and no review existed that discussed this issue deeply. Since I was not familiar with this mutation when I started using the strain, I spent so much time trying to interpret my data and this consumed a lot of my time and effort. Therefore, together with my PI we wrote a comment in Nature Reviews Molecular Cell Biology to raise awareness of researchers who are not familiar with the W303 strain, especially those who regularly use other strains or those who usually work with mammalian cells but use yeast for genetic screens only. We also combined all dissimilar results reported by researchers who did the same experiment using the wild type or the corrected strains and ended up with different results, for researchers to check easily. I got really interested in the RAD5 gene afterwards, and we wrote another review on the topic. We are currently also doing experimental work in the lab on RAD5. So, big frustrations you face in research can force you to think out of the box and walk a rewarding road you did not choose at the beginning. I was very proud when I received the L’Oreal-UNESCO fellowship for Women in Science. I felt that I am on the right track in my career. Actually, I first got to know about the L’Oreal-UNESCO awards when I was in Paris. I saw pictures of the five outstanding scientific female researchers in the Life Sciences who were chosen from across the globe to be awarded the L’Oreal-UNESCO international award in 2015. The first thing I noticed was the diversity of the applicants and I admired the idea of rewarding these great women scientists for their achievements. I dreamed one day I could be in their place. 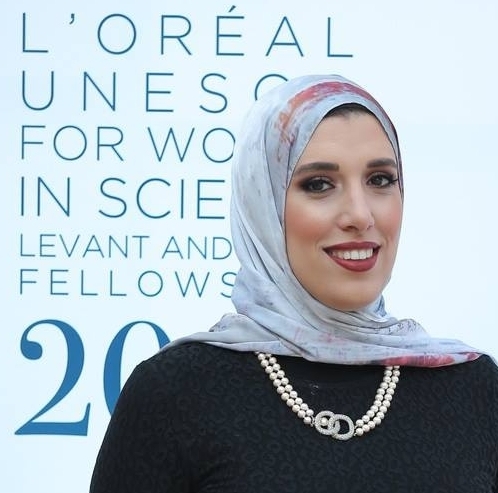 When I started my postdoc I got to know that the L’Oreal-UNESCO initiative offer fellowships for young female postdocs to encourage them to excel in scientific research. I decided to apply for the fellowship, which involved a competition between postdocs from six Arab countries and I was honoured to be among the winners of 2017. 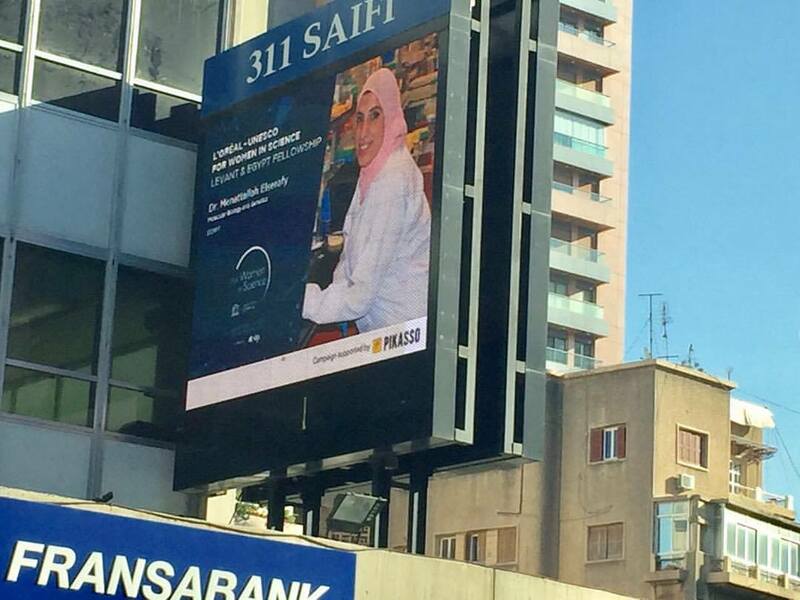 I was also extremely happy to see my picture in the streets of Beirut, Lebanon, where the celebration of the winners took place. Besides the story I mentioned, I was very proud of myself when I finished my PhD before turning 26. I realised that I managed to cross roads that I thought would be impossible to cross. What is a “day in the life” of Menattallah like? A typical day in my life would start by going to the lab early in the morning. However, working in academia means you have multiple responsibilities (experiments, writing papers and grants, supervision activities and teaching duties). Some days, I do experiments only. Other days, I would have to write papers or grants. Other days, I might have some teaching duties. I like my job, so I enjoy all duties. However, the days that I spend doing experiments in the lab are usually the most rewarding. I want to contribute to establishing a world-class research environment in Egypt. One day, I would like to have my own lab which publishes high-quality publications and competes internationally. I also have other future goals regarding mentoring female researchers and entering the field of science diplomacy. 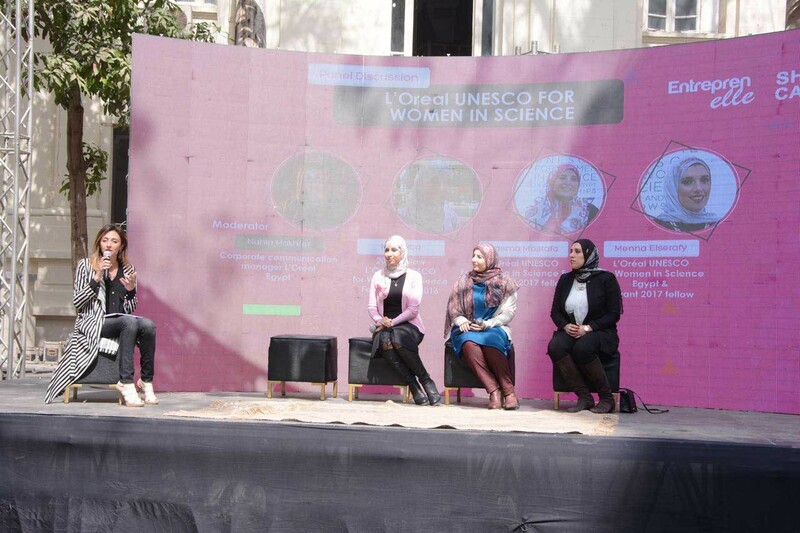 I am also glad that I recently got to join panel discussions and give talks in events that focus on motivating young students, empowering women and encouraging young women to pursue a career in science. I would like to always be part of these events in parallel to my research work at the current stage. But I believe I might dedicate a great part of my time in the future to these activities. I like to hang out with my husband and my friends. I am also a big fan of shopping. Moreover, I enjoy reading about different topics, but recently, I am focusing on reading success stories. Finally, I like to cook; cooking is very relaxing. I would tell them that they have unique qualities that can make them leaders in scientific research. First, women are multitaskers, and a scientific career requires balancing between time dedicated to research, grants applications, educating students, offering training and your personal life. Moreover, women are organised, and they investigate details more deeply, and these characteristics are necessary when it comes to research. Finally, I would tell them to dream big, to trust themselves and to choose an ambitious partner that supports your career and work together to positively impact each other’s career. There will always be breakthroughs in imaging, which will allow us to visualise molecular mechanisms better. Better visualisation will for sure allow deeper understanding of cellular mechanisms, defects and the causes of associated diseases. However, I believe the future breakthroughs will involve revealing deep connections between mechanisms that were never linked before. For example, understanding the interaction/cross-talk between different organelles better and linking signalling pathways that no one linked before. The representation of females in science, especially in leading positions, is significantly smaller than that of males. It is also worth mentioning that very few Nobel Prizes in the life sciences were awarded to female scientists. This problem is attributed to different factors, and in order to solve it, initiatives from governments, societies and individuals are required. However, this issue started getting more attention in the past years and multiple organisations and foundations have been calling for supporting women in science and offering special fellowships for females to adjust the female to male contribution ratio in science. I was very grateful throughout my career not to be discriminated against because of my gender. I was also lucky to be raised in a family that supports my career. That’s why I believe that family is the biggest contributor to the success of a woman. Thus, society needs to educate children at school about gender equality and increase their awareness to grow up as supportive men and women. I also believe that the existence of role models will definitely help to encourage young females to pursue a career in science. The presence of successful female figures is enough to inspire young female scientists to aim high and dream big. Furthermore, academic institutes should make sure that a minimum number of female research and faculty members are among their research and teaching programmes. In addition, no discrimination against females should be applied upon selection for leading positions. Moreover, to facilitate achieving this balance, high quality nurseries should be offered at work places, so that women could assure their kids are taken care of and focus well on their work.